Nicholas Wolterstorff is a brilliant professor of Philosophical Theology at Yale Divinity School in New Haven, Connecticut. This little book (111 pages) can be read as short devotionals; in one sitting; or used as a resource to guide a person through their own grief or helping a friend in their own grief. 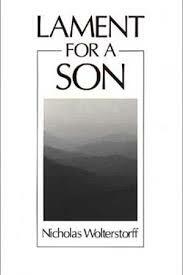 What makes this book unique is that Nicholas wrote the book as a very personal expression of his own grief in grappling with the death of his son (aged 25) who died in a rock climbing mishap while living in Europe in 1983. Wolterstorff’s journaling allows the reader to enter into one’s pain at an emotional, theological, and philosophical level. The most helpful section of the book is when Wolterstorff delves into how God suffers with us in our losses, and how he contemplates the sufferings of God the Father and His own Son’s death on the cross for the sins of humanity. Reading this book makes one appreciate the brevity, emotions, and depths of ultimate meaning in contemplating what loss signifies; and what ultimate gain means because of the reality of the Gospel – that Jesus empathizes with our plight and has entered into our suffering from the inside out. I highly recommend this book for parents that have lost a child; widows and widowers; and pastors, counselors, and friends who seek to comfort their friends who have experienced the loss of a loved one (especially a young child or young adult). (1) User friendly – Each chapter is divided into a short pericope (there are 29 chapters in the book based on an exposition of the text; as well as four additional chapters that discuss additional insights on key themes in the book). (2) Each chapter has a is divided into several helpful and brief sections: 1. Understanding the Text (The Text in Context; Historical and Cultural Background; Interpretive Insights; Key Themes; and Theological Insights); 2. How to Teach/Preach the Text; 3. Helps on Illustrating the Text. (3) Ronald W. Pierce does an excellent job of describing different interpretations of the text without being overly dogmatic in any particular category of interpretation. He offers a balanced style of interpretation and keeps the focus on the major themes in its canonical context (biblical theology). (4) The commentary is full of maps; color photographs; archaeological finds; graphs; sidebars; and tables to help you “see” or visualize what’s happening in the text. It is a very helpful feature that is rare in older commentaries. (5) Brevity. Pierce gives the essentials of what you need to know as a busy pastor or student of God’s Word. It’s practical; and yet provides quick and concise help when dealing with tough and controversial passages. 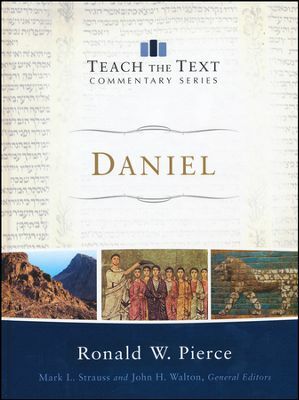 I highly recommend this commentary for anyone who wants to know, apply, and teach the book of Daniel. As a busy pastor constantly preparing sermons, training leaders, and teaching theology classes, I am always pressed for time to read materials outside of my ongoing ministry. Therefore, I especially appreciate books that are short, substantive, and practical. My greatest goal in life is to make as many multiplying disciples of the Lord Jesus Christ as I possibly can. This book has given me some great tools to use in the process of making and multiplying disciples. It’s only 83 pages but loaded with great ideas, questions, wisdom, and I believe will help me train my leadership and staff to be more effective and efficient in making and multiplying disciples. Mancini wastes no time in helping church leaders ask the right questions in order to genuinely evaluate their effectiveness in making and multiplying disciples. I didn’t count the questions he asks in this book – but there must be over 100 great questions of evaluation to help you become a church that truly makes an impact for the Kingdom in your community and beyond. I would highly recommend this book for staffs of churches, elders, deacons, church planters, and long time pastors. I plan on using this book at my next staff retreat. We are seeking to be a church that is less program driven and more missional. This book will help us evaluate our situation, develop a process to be a high impact church that makes multiplying disciples, and give as a road map to get there by asking great questions. (1) It’s thoroughness. Storms organizes this book by giving 100 exegetical meditations on the entire book. No stone is left unturned. Every single phrase and word is expounded upon – in its context, in light of its theological significance, and its practical ramifications are articulated. (2) It’s Christ-centeredness. Colossians is arguably the most blatantly Christo-centric book in the Bible. However, Storms passion for knowing Christ intimately is highlighted time and again in this book. (3) It’s readability. This book is not really a commentary but is written for the average, educated follower of Christ. (4) It’s meditative. Storms helps you think about the splendor of God’s majesty and deepen your satisfaction in Him through the wondrous work He has achieved for you in the person and work of the Lord Jesus Christ. If you were only going to have one book to guide you through understanding, meditating on, and applying the book of Colossians this is the book I would recommend you get – hands down. Thanks so much to Sam Storms for this gift to the Church and for all those who are passionately pursuing an intimate relationship with the Lord Jesus Christ. 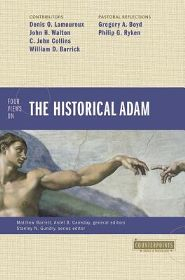 In this counterpoint book the subject of the Historical Adam takes center stage. There are four views presented: (1) No Historical Adam – presented by Denis Lamoureux, Professor of Science and Religion at St. Joseph.s College in the University of Alberta; (2) A Historical Adam: The Archetypal Creation View – presented by John Walton, Professor of Old Testament at Wheaton College; (3) A Historical Adam: Old Earth Creation View – presented by C. John Collins, Professor of Old Testament at Covenant Theological Seminary; and (4) A Historical Adam: Young-Earth View – presented by William D. Barrick, Professor of Old Testament at The Master’s College. The format of the book is as follows: Each Professor writes on essay addressing three essential questions: (1) What is the biblical case for your viewpoint, and how to you reconcile it with passages and potential interpretations that seem to counter it? (2) In what ways is your view more theologically consistent and coherent than other views? (3) What are the implications your view has for the spiritual life and public witness of the church and individual believers, and how is your view a healthier alternative for both? Upon answering these questions each scholar counters followed by a rejoinder from the presenter. At the end of the book there are two essays representing two different stances on the debate and impact on the Christian faith by Greg Boyd (Senior Pastor at Woodland Hills Church in St. Paul, Minnesota) and Philip Ryken (President of Wheaton College and the former pastor of Tenth Presbyterian in Philadelphia). I Appreciated the personal testimony of Denis Lamoureux’s pursuit of truth in the fields of science and theology. He has definitely wrestled with and struggled with all the issues at hand – as a non-believer, as well as a believer in Christ. Lemorourex concludes that his view of evolution disallows for belief in the historical Adam that is revealed in the Scriptures. He argues at length that the reality of history conflicts with modern science. He believes that ancient science (the view of the biblical writers) conflicts with modern science and therefore what we have in the Bible is God accommodating inerrant spiritual truths. Lamoureux argues that Adam did not exist, but that Jesus Christ is a historical person who died and rose again for our sins. He attempts to show how modern science has changed his views on interpreting the Bible through understanding distinctions between ancient and modern science, language accommodation, and his rejection of concordism. In contrast to Lamoureux, John Walton believes that Adam was a historical person. He believe’s that the primary emphasis of the Bible and Ancient Near Eastern literature is to demonstrate that Adam (and Eve) are archetypal representatives of humanity. He believes that Genesis 2 is not about the biological origins of Adam and Eve. He argues that Adam and Eve may not even be the first humans who came into existence or the parents of all humankind. Walton doesn’t reject or accept evolution, but his view does allow for evolution and an old earth. I found Walton’s essay to be difficult to follow and his discussion of archetypes to be interesting, but not totally sustainable. C.J. Collins, like Walton, agrees that Adam and Eve were real historical persons. He demonstrates in his essay with great theological precision how a real Adam and Eve are necessary to demonstrate our need of Savior (the second Adam – Jesus) to save us from the sin we inherited as legitimate children of Adam’s race. He does a wonderful job of showing that the story line of the Scriptures reveals three major truths: (1) Adam and Eve as a pair represent humankind as one family; (2) Adam and Eve were created supernaturally by God; (3) Through Adam and Eve came forth sin. As a result all humanity is guilty before our creator God for our experience as sinners, and in need of redemption from the perfect Adam – the Lord Jesus Christ. An interesting aspect of Collins’ view of Adam is that he may have been the chieftain of his tribe, i.e., there were perhaps many more people around when Adam and Eve were around. He is also critical of theistic evolution because it fails to account for the special creation of human beings as made in the image of God. He does not believe that a literal twenty-four hour days in Genesis One is required to maintain inerrancy. Michael Barrick, expounds the most traditional of the four views presented. He argues for the supernatural creation of Adam by God, who is the father of all mankind. Barrick gives the most emphasis of the four views to the significance of Adam in understanding and applying the gospel. He holds to a literal twenty-four days and young earth perspective. He holds to a high view of the Scriptures and believes his view best accounts for the consistent testimony of the biblical authors (Moses and Paul) with Jesus’ teaching. Barrick’s essay argues that when science and the Bible have a conflict – science must always concede for Scripture is inerrant and totally authoritative on all matters it addresses. In the concluding section of the book Greg Boyd and Phil Ryken (Theologian/Pastors) address the following issues raised by the other essayists by answering the following six questions: Does Adam’s existence or nonexistence (1) affect the rest of the Christian faith and those doctrines Christians have historically affirmed throughout the centuries? (2) shape a Christian worldview, especially the biblical story line from creation, fall, and redemption, to new creation? (3) have an impact on the gospel, or how the gospel is preached and applied, specifically in church? (4) have influence on how we live the Christian life and ‘do church’ as the body of Christ? (5) make a difference in our evangelical witness to a watching world? and (6) What is at stake in this debate for evangelicals in the church today? Of the four views presented I found myself in the most agreement with Barrick, followed by Collins, then Walton, and lastly by Lamoureux. I think that Barrick’s essay was the easiest to read because it was the essay that took the passages of Genesis at face value – literally. The other three essayists seemed to have to do a lot of hermeneutical gymnastics to make their views work. This is a complicated issue. I appreciated the grace reflected by Lamoureux, Collins, and Walton in particular. Barrick came across more defensive and dogmatic than the other three. At the end of the day, this book deserves a wide reading. It shows the immense complexities of hermeneutics, science, theology, history, and inerrancy. I appreciated what each writer taught me – I gained new knowledge and insights on all five of these topics. I had many questions answered, and yet still have many unanswered questions. My hope is that this book will continue to spark theologians and scientists to work together in the pursuit of truth. I am grateful for the time invested by all the contributors and heartily recommend this book. It is a challenging read, but well-worth the effort. One of the things that all Protestants and Catholics have in common is that we participate either weekly or monthly in the remembrance of the Lord’s Supper or Communion. In this concise and yet very thorough treatment of what the Bible teaches about the Lord’s Supper R.C. Sproul gives several cogent reasons why Christians around the world remember the body and blood of Christ in the past and present and look forward to His coming in the future. Dr. Sproul looks at the roots of the Lord’s Supper in examining the Old Testament Passover from the Exodus; the Last Supper of Christ in the Gospels; and the Marriage Supper of the Lamb in the Kingdom of Heaven. The history of the Supper is examined, the theology of the Supper is explained, and the meaning of the Supper is articulated so that we can best apply its meaning as we participate in the elements as we remember the death, burial, resurrection, and coming of Christ by worshipping Him in spirit and in truth. Reading this book will help you to appreciate and value the partaking of the cup and bread all the more as you remember the amazing sacrifice of the Lamb that was slain to save us from God’s wrath, and unto His gracious presence forever. You will come to a deeper understanding of the necessity of a “bloody” sacrifice, and of the “body” that was slain on our behalf. There is much spiritual meat here, to bring you to deeper intimacy with and reflection on the Lamb of God who takes away the sins of the world. In the twenty five years that I have been involved in ministry as a pastor I have oftentimes been frustrated with discipleship materials. I have found them to either be too simplistic, or too abstract and academic. I think Robby Gallaty has struck a good balance in “Growing Up” by providing disciples of Jesus with a balanced resource for beginning and advanced disciple-makers. The book is full of biblical principles, powerful illustrations, and practical insights to help disciples of Christ make multiplying disciples of Christ. 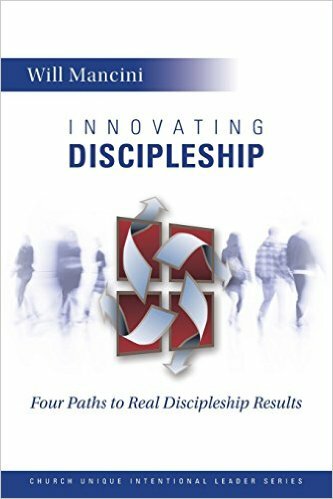 In the first four chapters Gallaty gives his own testimonial of how discipleship made a huge impact on his own journey with Christ and gives a passionate biblical argument for discipleship and why being a disciple and the making of more disciples should be at the forefront of a Christian’s life. The strategy of becoming and making disciples articulated in this book is the idea of D-Groups (Discipleship Groups). D-groups ideally consist of a group three to five men or women (gender exclusive) who meet weekly and have three primary purposes: (1) growth in the knowledge and imitation of Christ; (2) growth in the ability to articulate and defend the Christian faith; and (3) and helping to guide others in the faith – sharing what you are learning with others along the discipleship journey. The ultimate goal of being a disciple is to make more disciples. Gallaty makes a great case for the effectiveness in discipleship groups of 3-5 people. How are D-groups different from a regular small group? Here are some differences: (a) The D-Group is a closed group open by invitation only; (b) consists of believers who desire a deeper walk with Christ; and (c) has the dynamics of community rather than a teacher-pupil or mentor-mentee relationship. Herein lies the key to multiplication. After twenty-five years of being involved in the process of making disciples I have found this to be true. I haven’t seen a lot of multiplication from one-on-one discipleship, but I’ve seen much more multiplying accomplished in groups of 3-5. I’ve never called them “D-groups” but the principles are the same no matter what you call them. One of the examples Gallaty gives is what if Jesus had discipled Judas one-on-one rather than John, Peter, and James? In other words the disciples knew how to be and build a community of disciples through discipleship. Jesus wasn’t just a teacher who taught pupils – He showed them how to live life with all that it entails. This is so important because discipleship is more than just information, or just teaching. It is about a radical lifestyle that affects every aspect of life. When 3-5 disciples are growing together there is an organic aspect that takes place in communal growth which one-on-one simply doesn’t usually achieve. The spiritual climate that God uses to bring about growth in our lives involve people, circumstances, and the spiritual disciplines which are best nurtured in the context of communal commitment in a D-Group. In the second half of the book Gallaty uses the acrostic C.L.O.S.E.R. to talk about six spiritual disciplines that need to be taught, nurtured, and developed in a D-Group. These six chapters focus on six disciplines that Jesus modeled and taught to His disciples: (1) Communicate – how to talk with God through prayer; (2) Learn – to understand and apply God’s Word in your life; (3) Obey – God’s commands; (4) Store – God’s Word in your heart through Scripture memory; (5) Evangelize – how to share Christ with others; (6) Renew – yourself spiritually every day. Each chapter stands alone, and yet builds on the previous chapter – much like stones making a sturdy wall. All of the chapters have (a) questions to consider for discussion; (b) Points to ponder; and (c) A Scripture verse to memorize on the theme of the chapter. The book is designed to establish D-Groups and is for D-Groups. One of the great features of the Book is the Appendix Section in the back which consists of 11 helpful resources: (1) A Disciple-Making Covenant; (2) Spiritual Journey Inventory; (3) Sample H.E.A.R. Entry (He talks about this in the book – HEAR stands for what to “Highlight” from God’s Word, “Explain” from God’s Word, “Apply” from the passage to your life, and “Respond” to in your life; (4) A Bible Reading Plan Called E100 (from the http://e100challenge.com. ; (5) A Prayer Log; (6) A Scripture Memory Card; (7) Accountability Questions; (8) 7 Different avenues for building relationships; (9) 12 Commonly asked questions about D-Groups (e.g., How do I choose disciples?, How many people should be in the group?, Where and how often should we meet? and so forth); (10) Suggested resources for D-groups; and (11) How to pray for lost friends. I highly recommend this book for five primary reasons: (1) It will fire you up to be a disciple and make disciples in the context of community; (2) It will give you a strategy and plan for making disciples; (3) It will give you all the tools you need for making disciples; (4) It will convince you that discipleship for the Christian is not an option – it’s what it means to be a Christian! ; (5) It will make you want to teach and apply the material in your own D-Group. 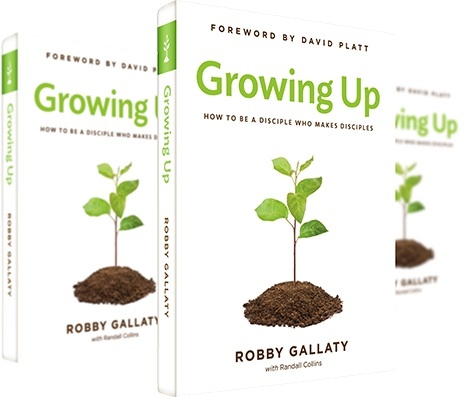 Robby Galatty’s “Growing Up” is based on Psalm 1:1-2. He plans on writing two more books in this series: “Firmly Planted” based on Psalm 1:3, followed by “Bearing Fruit” based on Psalm 1:3b. I am already looking forward to reading and applying these books with my own D-Group. Gallaty has written a book that is biblical, theologically rich, extremely logical and eminently practical. I predict that it may be one of the most used discipleship training workbooks to ever come along. I am grateful for this book and can’t wait to start a D-Group and apply it!